Ephraim KEMPTON Jr. (1621 – 1655) was Alex’s 9th Great Grandfather; one of 1,024 in this generation of the Miller line. Ephraim Kempton Jr. was born 18 Mar 1621, London, England. He was baptized 24 Jun 1623 at St. John The Baptist, London. His parents were Ephraim KEMPTON Sr and Elizabeth WILSON. He came with his father to Plymouth in the winter 1639/40. He married Joanna RAWLINS on 28 Jan 1646 at Scituate, Plymouth Colony. Ephraim’s inventory was taken 2 July 1655 and his orphan children were adopted into other households. Other sources says that Eprhaim died on 15 Mar 1660 Plymouth, but that was actually Thomas RAWLINS , Emprhaim’s father-in-law who died on that date. Joanna Rawlins (Rollins) was born about 1630 in Scituate, Mass. Her parents were Thomas RAWLINS and Mary [__?__]. Joanna, and her sister Mary, and brothers Thomas, Nathaniel and John, all born in England, came with their parents in 1630. Her father came to Roxbury from England in 1630 in the first company was a carpenter and planter; removed to Scituate where his wife Mary died about 1639. Joanna died 31 Mar 1656 in Scituate, Mass. Plymouth Jun 1728 in Plymouth, Mass. 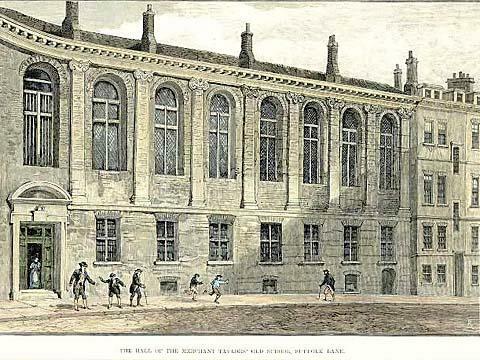 Ephraim attended the Merchant Taylor’s School in the City of London where his brother John enrolled in 1630-1634. The brothers appear as ‘john Kempton ma’ and ‘Ephriam kempton minor,” the time honored way in which English private schools distinguish between two brothers attending the same school, major indicating the elder of the two; not seen thereafter. Ephriam Kempton and his father of the same name immigrated to the colonies between 1638 and late 1640, when they settled on a farm of twelve acres in Scituate, which had been purchased by his brother Manassas Kempton from Elder Henry Cobb. The names of both Ephraim and Ephraim Sr. appear on the list of 1643 of those able to bear arms, but that of Ephraim Sr. was crossed off afterward, his age doubtless exempting him from service. Ephraim settled in Scituate where his Uncle Manasseh lived. He was on the grand jury, 1641-42-46; surveyor at Scituate 1642-44; on town committee, 1643; deputy to general court, 1642-43; returned to Boston where his wife died December 27,1655. In 1640, Manasseh Kempton purchased two separate properties in the Town of Old Scituate from Henry Cobb. One was a 12 acre “farm” with a dwelling house on it in the then future village of Scituate. The other purchased property was an undeveloped 80 acre upland lot adjacent to the North River with an attached 12 acre marsh. It was the 80 acre North River property where the Kempton family first settled and is now located in the Town of Norwell not far from the village of Norwell. Ephraim Kempton 3rd of Boston and later of Salem sold a minor portion of this lot in 1672 to John Bryant and then sold the major portion of this property in 1675 to John James of Scituate (NEHGS Register, Vol. 153, page 437-8). Manasseh Kempton probably sold his 12 acre Henry Cobb Scituate village lot to Thomas Rawlins Sr., father-in-law of Ephraim Kempton Jr. Thomas Rawlins sold the Cobb village lot to Stephen Vinal of Scituate in 1752 (The Mayflower Descendant, Vol. 35, page 143). 1646 – While serving as Constable of Scituate, MA he and John Hollett failed to collect the proportion of taxes to be bourne by the town for expences of the Governor and assistants in the amount of 4 pounds 10 shilling. The court issued a warrant which required them to be present at the next General Court and give their account “concerning ye officers wages”. “Ephraim Jr. was left the farm by his father Ephraim Sr. and continued to live there with his wife Joanna. He was a substantial citizen serving as constable, surveyor of highways, and a member of the grand jury. Mr. Kempton’s inventory was taken 2 July 1655 by James Torrey and Thomas King. The only references to real estate are ‘hemp and flax and corn on the ground.’ His widow survived him by less than two years and left four orphaned children, the eldest being about nine years of age and the youngest under three. Inventory of Ephraim Kempton taken Jul 22, 1655 listed: £64, 13 shilling, 4 pence. The inventory of the widow Kempton on Apr 10, 1657 amounted to £38, 11 shilling, 6 pence. No real estate was mentioned. Although there is no documented proof, all signs show that Ephraim III and his sister Ruth were raised in in the household of their grandfather Thomas RAWLINS household in Boston. His grandfather received the sum of ten pounds from William Brookes as rent from the farm in Scituate to be used for the bringing up of the children. The farm then came to Ephraim when he was of age. “Ephraim is first noted in Boston on the tax list of 1674 as a master of a family, having married Mary Reeves the year before. “1 Nov 1676, Ephraim Kempton of Boston, gunsmith, sold his farm in Scituate. Ephraim’s wife Mary Reeves was born 7 Nov 1653 in Salem, Essex, Mass. Her parents were John Reeves (1616 – 1681) and Jane [__?__] (1620 – 1648). Mary died 1687 in Salem, Essex, Mass. Ephraim Kempton 3rd of Boston and later of Salem sold a minor portion of this lot in 1672 to John Bryant and then sold the major portion of this property in 1675 to John James of Scituate (NEHGS Register, Vol. 153, page 437-8). He lived in Boston where he followed his trade of gunsmith, but may have late in life returned to Plymouth. Before 1677 he left Boston to settle in Salem. He was legatee of his uncle, Thomas Rawlins, of Boston, a member of the Artillery Company, in 1642, under his will dated December 12, 1681, and administered the estate jointly with Samuel Marshall. Savage says of his wife: “The widow is one of the instances well authenticated (as very few are) of much exceeding one hundred years. Her memory was accurate, if not happy, for she saw the head of Philip, the Indian king, upon a pole at Plymouth, where it remained over twenty years from his fall, and she said that a wren used to make her nest in the skull where she hatched her young every year. When is father-in-law John Reeves grew old, the Kemptons cared for him and as a result received the lion’s share of the aged gentlemens property, including his homestead farm. The other Reeves children. William Reeves and Mrs. Elizabeth Richards, were allotted only a small part. They contested the will but lost. Mr. Kempton also became heir under the will of his bachelor uncle Thomas Rawlins of Boston in 1693, receiving one half of his uncles’ homestead at Milk St. and Mackerel Lane. His sister Mrs. Ruth Marshal receied the other half. In 1698, Mr. Kempton sold his share to his brother-in-law Samuel Marshall for thirty-three pounds. Mannasses never married. On 31 Aug 1733, Manasseh, who was was living in Southampton, Long Island NY, gave full power of full power of attorney over all his lands, etc ‘in the Province of Massachusetts Bay or Elsewhere” to his nephews Ephraim Kempton, shipwright, lived in Plymouth much of his life and his brother Samuel Kempton. Manasseh deeded to his nephew Ephraim (son of his brother Ephraim) one half of the lands he owned in Dartmouth. This deed was recorded in Bristol County Court on 5 Sep 1733. On 12 March 1733/34, Ephraim-4 deeded one half of the lands that he had received from Manasseh to his brother Samuel Kempton shipwright of Plymouth, for the sum of 5 shillings. Although there is no documented proof, all signs show that Ephraim III and his sister Ruth were raised in in the household of their grandfather Thomas RAWLINS household in Boston. Ruth’s husband Samuel Marshall was born about 1647. Samuel died Feb 1742/1743 in Boston, MA. Original sources for family records: Scituate Vital Records 1:49,54-59, NEHGR 57(1903):82-5 “Records of the Second Church of Sciutate”. For an account of Ephraim2, see “The American Genealogist 67(1992):132-4 and the forthcoming Ancestry of Eva Belle Kempton Vol.1. Info on Ephraim and his family is in “Seeing Double: The Children of Ephraim2 and Joanna (Rawlings) Kempton” by Dean Crawford Smith and Meline Lutz Sanborn, New England Historical and Genealogical Register 148:342-344. That source gives his father as Ephraim-1, gives marriage, untangles duplicate conflicting records regarding actual children and their birth/baptism dates, etc. It does not elaborate on the birth of either Ephraim or Joanna. This entry was posted in 11th Generation, College Graduate, Immigrant - England, Line - Miller and tagged Merchant Taylor's School, Plymouth. Bookmark the permalink. Manasseh Kempton married about 1717 to Mehitable Holmes, daughter of John Holmes Jr and Patience Faunce. I believe that the Manasseh Kempton that married Mehitable Holmes was Ephraim Kempton Jr’s grandson, the son of Ephraim Kempton III and Mary Reeves.